Welcome to another wonderful color challenge at The Play Date Cafe! This weeks sponsor is Artistic Outpost, they'll be giving this weeks winner a $14 Gift Certificate! I'm excited to share with you that the entire PDCC Design Team is using Artistic Outpost images in their creations today, and the Designers from Artistic Outpost are playing along with this weeks color story too! Remember, there are no vendor restrictions at the PDCC, but if you have Artistic Outpost images, why not use them, if you do, don't forget to enter Artistic Outpost's Monthly Referral Program* for another chance to win! 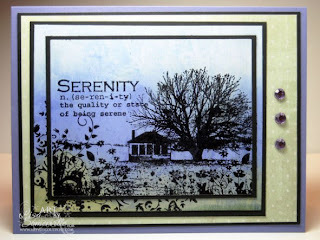 I used one of my favorite Artistic Outpost plates, Serenity, to go along with Sarah's color story. The image is stamped in Black Archival on Matte card stock. To color my image I used the Pulled Glimmers Technique from the TJNL. Once my panel was dry, I used Spellbinders Rectangle Dies to cut the image from the center of my panel, layered the stamped panel on Black. Then using the flourish image from the set, I stamped on the remaining colored panel. We'd love for you to play along with this weeks challenge at The Play Date Cafe, you can find all the details here on how to enter. If you upload to any online gallery please use keyword PDCC#38 so we can find your creations! Play along this week for your chance to win a $14 Gift Certificate from Artistic Outpost. Don't forget to visit the Artistic Outpost Blog to see what their Design Team did with this weeks PDCC colors. Ohh.. Ahhh... Loved your beautiful background and image! This is one of my favorite images from AO! I feel my wish list growing! This is so gorgeous, Lisa! A beautiful card! this is so cool- gotta get me some of these AO images...gorgeous! Your card is awesome. The panels really highlight a wonderful stamp and the background is perfect. Serenity is right! Beautiful job with the color challenge. Love you card! Have a great day! this looks very serene, love the color behind the house against the green background papers. Beautiful! Sweet Serenity, the set made just for you! Great card, luv the layers, colors are perfecto! Creatively Innovative...Now you have me thinking...what I can do with layers..and diecuts.. I love touch of peaceful expression your card portrays. This is gorgeous, Lisa! Love this plate and love how you've worked your magic with it once again!! Wonderful card! Makes me relax just looking at it! Such a pretty card Lisa! Such a calm & serene horizon! Love how you've interpreted the colours this week, that image looks great with the way you've done the layering, lovely! BEAUTIFUL! Such a gorgeous card! Here it is!!!! such a soft and delicate look, just Lovely! lovely card, thanks so much for introducing AO to PDCC! 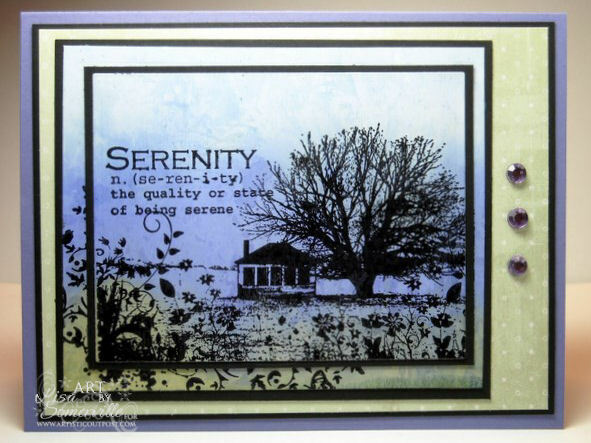 I love how the stamping extends beyond your main panel ... and these images are so pretty in these colors.